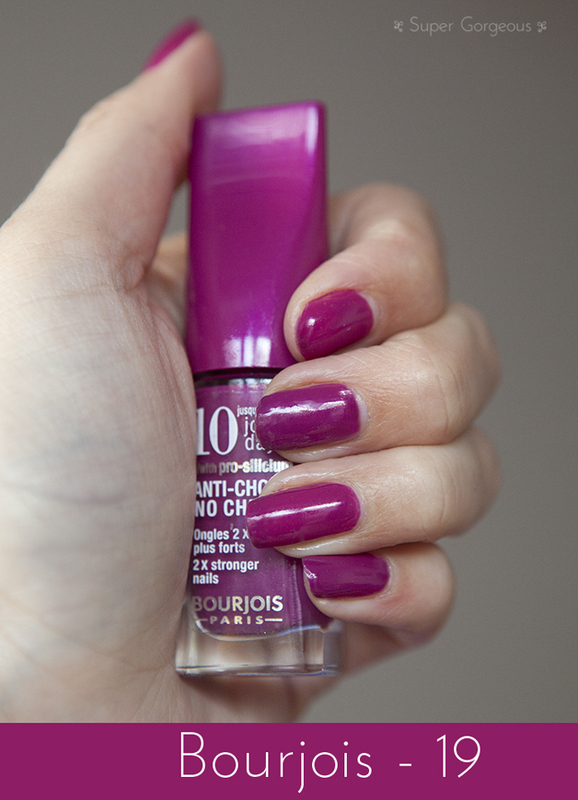 I recently won a lovely bundle of Bourjois goodies from a giveaway that Simone Loves Make Up was having and part of the prize were some of the new 10 day nail polishes, which I was eager to try. A nail polish you can find on the high street that lasts for 10 days?! Tell me more! The packaging would lead you to believe that the polish lasts for 10 days - what with the big '10 days' labelling on the bottle, however if you read the small print you will see that it says 'up to' before that, and on the back of the bottle it says that it lasts for 3 days minimum. It also says that the brush is perfect for touch ups... so I believe they are expecting it to chip, but because of the new shaped brush, claim it's easy to correct. While we're on the subject of the brush, can I just give it a 'wow'?! I l-o-v-e it! It's really wide, with a slanted edge - the longer side enables you to get right down into the sides of the nails without getting it all over your skin, and I imagine it is also good for touching up chips, which you would definitely need if you wanted to keep it on for 10 days - mine only lasted for 2 before the tipwear began and on day 3 it's had to come off because of the chips. It is a raspberry coloured polish which is totally opaque and really would have been fine with just the one coat. I have had lots of comments about how pretty it is - and off the top of my head I can't think of another polish I have like this, which is a rarity! If Bourjois hadn't made such high claims about the new formula being 'anti-chip' I wouldn't have had a bad word to say about this nail varnish - it goes on well and lasts as long as any other normal polish. I really hope the brush is here to stay! Have you tried any of these nail polishes? How long did they last on you? This is what I got too - and mine chipped to buggery within 24hrs!